Ok, so I've mentioned that I have wanted to get better at woodworking. As a result of this, I decided to go ahead and do something I've been wanting to do for a while. I made my wife a custom knife block for Christmas. 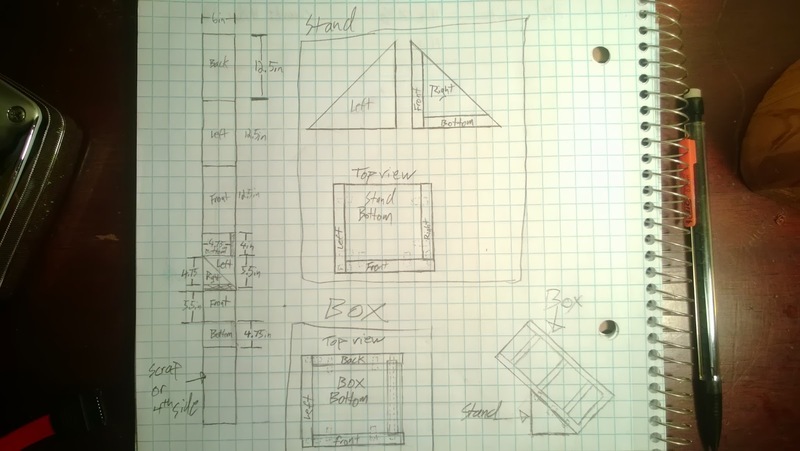 Once again, while no expert, I'll walk you through what I did, and will give you the plans that I came up with, as well as anything that I would change about the project. 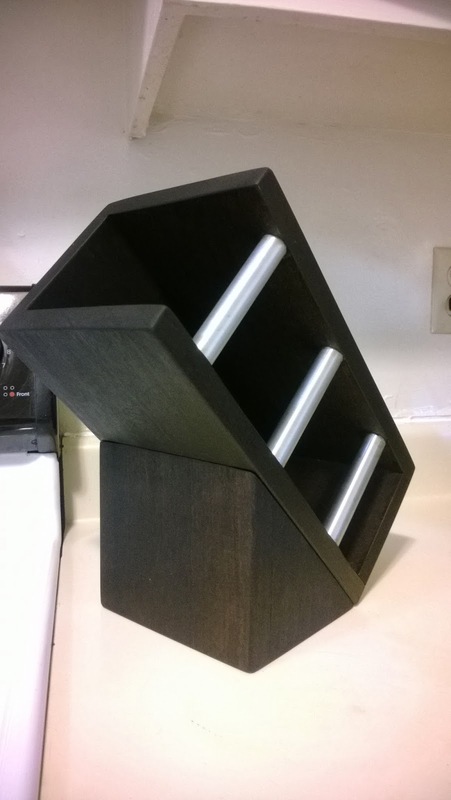 The first thing about this project that makes it stand out is the type of knife block is. I designed and built a bamboo skewer knife block. Why bamboo skewers you say? If you've looked at some of my other posts, you'll notice that I'm a bit of a knife guy. On occasion the knives in the block change, and sometimes the knives don't fit in the old slots of normal blocks. This causes problems. Second (and more importantly) the other thing about normal knife blocks is that they are difficult to clean inside the long slots. With a skewer design you can clean it easily by either swapping out the skewers or washing them. Score. It looks unique and awesome. A knife bock like this is simple. There are no fancy cuts to make. Instead of having specific slots in the block for the knife to fit in, you simply make a open area for the skewers. 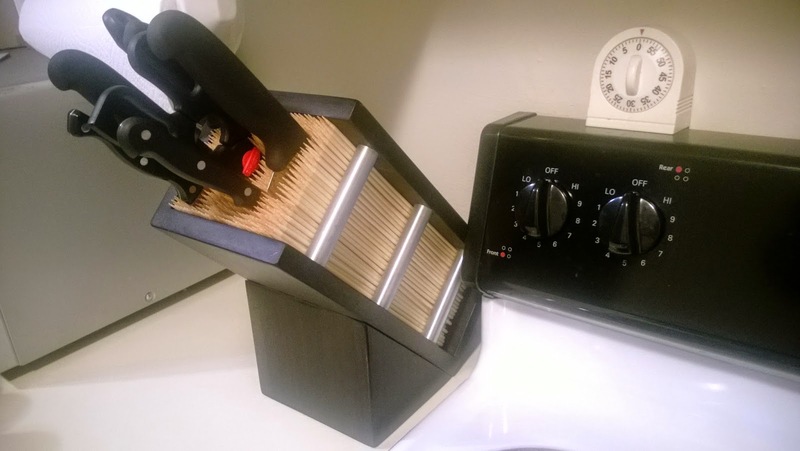 The other nice thing about designing a knife block is that it is non structural in design, meaning, it doesn't have to support any critical amounts of weight. Therefore you don't have to be a structural engineer to build one, and you can use just about anything design you can come up with. 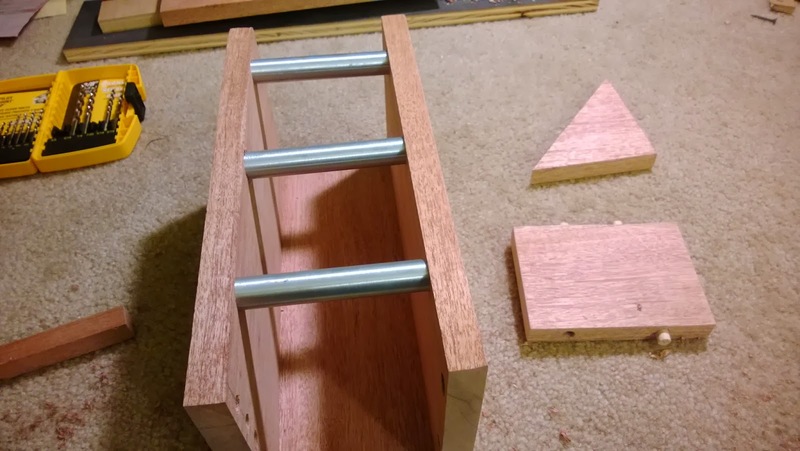 Because I'm an amateur, with only three "real" tools I decided to make the design something easy to both cut, and build. I mean, this is really just my second or third project. If you have a biscuit cutter, and don't want the "aluminum accent pieces" you can skip the EMT and the wooden dowel. The same goes for if you don't mind exposed screws in your finished product and don't want the EMT. Here is the cutsheet/assembly diagram that I made for the 1x6. You can see that the cuts are arranged to make them as easy as possible. You can also see roughly how you're supposed to put the thing together. And Sorry about the size, but I wanted this to be halfway readable. 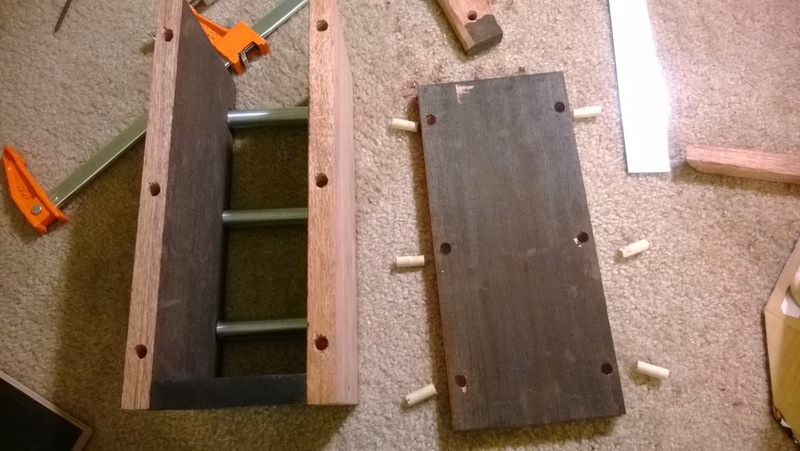 The block will be assembled using wooden dowel construction to keep the edges free of any fasteners. If having screws on the edges doesn't bother you, then go ahead and use them. Its amateur hour here in the construction portion, so keep any construction comments primarily "constructive" (< see what I did there :P). 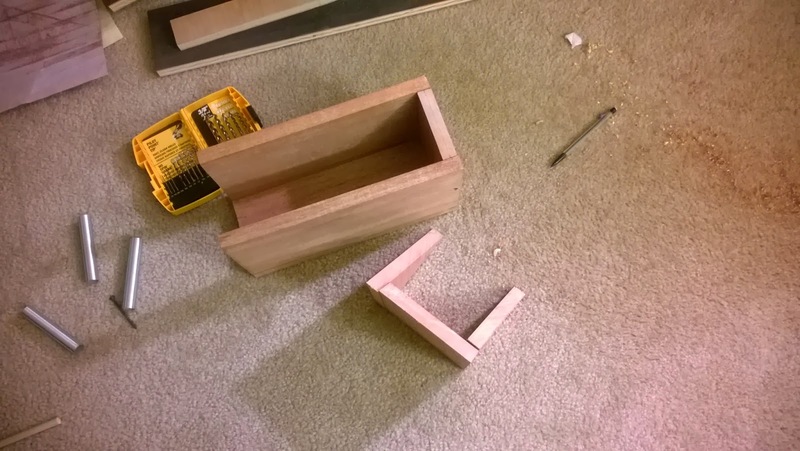 First, I measured out and cut the main box pieces as well as I could with only a square and a jigsaw. 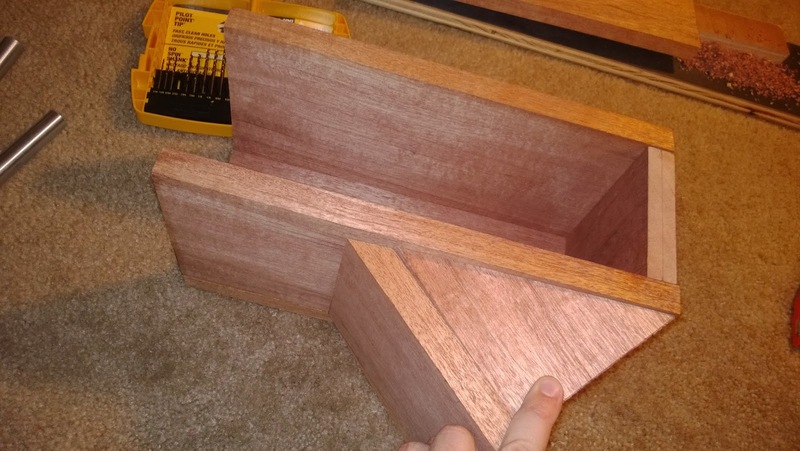 I then cut the bottom for the box. With these pieces, I started assembly. Wooden dowel construction is simple in concept, and if you have a drill press, it is pretty straightforward. If you don't have either of those pieces it gets harder, but it still is doable. The hard part is getting the holes lined up in the boards correctly, if you're off by any the joints will be visibly off. This happened below, and I had to redrill a whole new set of holes. So I'm clearly not perfect in my woodworking skills yet. Before I got my "drill depth guide" set up, I accidentally drilled right through the board on the bottom, luckily that board was going to be covered up anyway. The good news is because this is solid wood, if any of your wholes aren't lined up perfectly, you can just sand it down. Just take your time, and it will turn out fine. 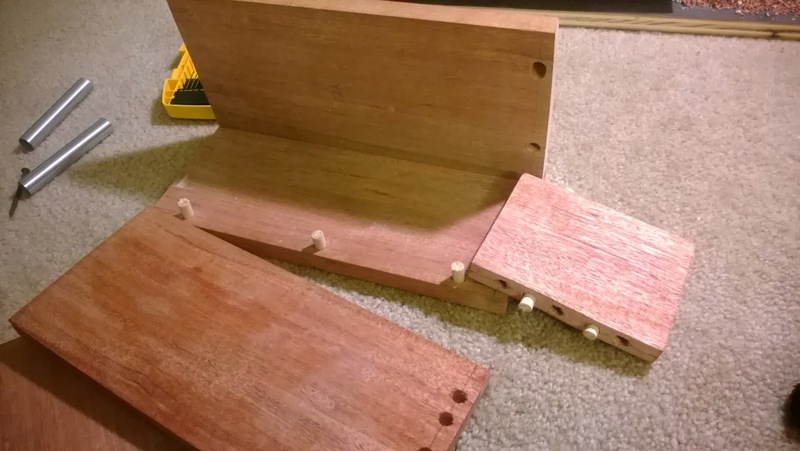 To help line things up I made a crude jig (scrap piece of wood of the same thickness) to get the holes centered. I also made a VERY crude drill depth indicator (tape on the drill bit). The wood is 0.75in thick, so I decided to go a half inch deep on each side, and cut the dowel into one inch long pieces. Pro-tip: drill a small pilot hole first, its much easier to get the hole centered with a tiny drill bit. Then move on to the 3/8in bit. Otherwise, your holes will not line up as well as you want. And now the part most people want to see. Here are some photos of the construction. I elected to design this with three brushed aluminum bars on one side instead of finishing the box off with mahogany. Because of that choice, I made things harder for myself (but it looks great, so I can't complain). 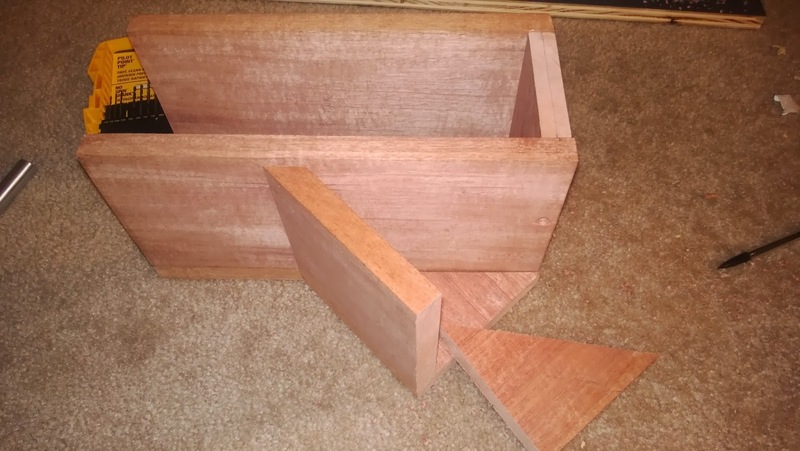 The EMT pipe was cut to the right length, and then the dowels were used just like they were in other dowel joints, except in this case the dowel is long enough to pass through the EMT and into both sides. Then I started construction on the "stand" portion of the project. The same process happened here as in other portions of the project. Cut the wood, drill the holes, etc, etc, etc. Bam, here is the finished product. I am happy with the end product. It looks fantastic, gets lots of comments from house guests and is very functional. If I made another one would I change anything? yes, yes I would actually. First off, I would make it larger. The size I built looks great, but we have a hone, three full size knives (8in chef, 7in santoku, 10in bread), two paring knives, and a set of kitchen shears. Secondly, I think I'd make a separate spot for both the hone ("butchers steel"), the smaller knives, and the kitchen shears. The hone gets stuck in the skewers a bit, and takes up a lot of space. Same thing with the shears. I think I would use 1x6 for the sides, and 1x8 for the front and back. This would just make it wider, but not make it take up much more space on the counter. I could add a section only for the small knives, but I'm not sure how I'd do that at this point. Anyway, if you have any questions or feedback let me know.